So I’m British and proud of my (imperfect) country. 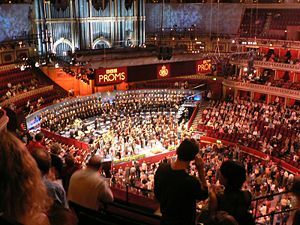 For those of you who don’t know, each year the good old BBC (“Auntie”) stages and transmits a whole series of Promenade Concerts (The Proms) from the Royal Albert Hall in London. This year the concerts run from 16th July through to 11th September. A good range of orchestras and singers, some world famous, some less so, are chosen to perform a varied selection of music over the season. The traditional highlight of every Proms season though is the “Last Night”.